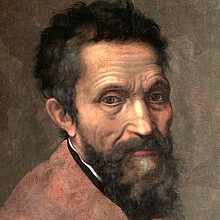 Michelangelo Buonarroti (1475 - 1564) is one of the great masters of Italian art. He was born in Caprese, near Arezzo, into an important Florentine family which, at the time, was experiencing a period of economic difficulties. A few months after Michelangelo’s birth, his family returned to Florence. In 1487, he began his apprenticeship at the workshop of Domenico Ghirlandaio. A few years later he attended the Garden of St. Mark, a kind of art academy funded by Lorenzo the Magnificent. Here young artists had the opportunity to observe and copy part of the collection of ancient works of the Medici family. During his life, Michelangelo left Florence for long periods. Many of his works are still preserved in his home town. At the Uffizi Gallery there is a famous painting by the master, the Doni Tondo. The Doni Tondo is a tempera on panel, which has a diameter of 120 cm, made around 1503-04. Michelangelo painted it for the banker Agnolo Doni, probably on the occasion of his wedding with Maddalena Strozzi. The painting represents a Sacred Family, with the characters arranged in an articulated pattern. In the background there is a group of nudes, representing - according to some historians of art - the age of paganism. From a stylistic point of view, the work marks an important step towards Mannerism. Human figures are represented as a sculptural group because, according to Michelangelo, painting had to imitate sculpture. The colors are very lively: this is a very original choice for that period. The opera is in one of the Red Rooms of the Uffizi Gallery.